I felt a familiar rush of excitement and anticipation as our plane from Sydney landed in Yulara, home of the famous Uluru. I was to accompany my nephew Paul and his wife into the Outback to meet and hopefully spend time with an Aboriginal tribe called the Anangu, on their private land. The rich, red earth with clumps of tussock and unbelievably large ant hills bulging out of it, disappeared into the heat haze on the horizon as we sped along the Stewart Highway heading south for the Pitjantiajara lands. This huge area encompasses parts of Central, Western and Southern Australia, home to the different tribes who speak the Pitjantiajara language. Part of this land was owned by the Anangu, with whom we were to meet up. Our contact was a man called Lee Brady. He had grown up in Sydney, but seeing the problems the Aboriginal people were having in the cities, decided to go back to his roots to find a way to help the people. 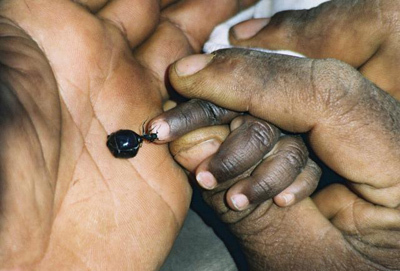 He was married to Leah, the traditional Anangu land owner. Together they worked to protect the land and educate the young people before they left their families and came into contact with the big cities. There was a strict rule of no alcohol allowed on this land. The Anangu people travel together in a nomadic way, moving around in old pick-up trucks loaded with their simple belongings. During the day they climb rocks and hunt the big lizards, or chase the kangaroos and other wild life following them in their trucks, weapons at the ready. At the end of the day they come back to the camps to cook their catch over the fire, where they sit and tell stories long into the night. After about 4 hours bumping along the roads which had now become dusty tracks, we finally arrived at our destination in the late afternoon, a sheltered clearing in the heart of the desert. Brett lit a fire and told us to position our swags near a line of scrub in front of a hill covered in red rocky outcrops. After a good dinner and numerous cups of tea, we climbed into our swags, making sure that the covers were well over our heads as the wind was starting to get up, which meant red sand was flying everywhere. I got used to the slightly claustrophobic feeling of canvas pulled over my head – but on a still evening, sleeping under a ceiling of sparkling stars in the cool clear atmosphere more than made up for the uncomfortable windy nights. I awoke in the early hours of the morning, the sun still a pale pink orb, picking out the jagged silhouettes of tree stumps against the glowing sky. I heard laughing voices and was aware of the acrid smell of smoke drifting across the sand – they had arrived! A dog, actually a baby dingo, was barking and someone with a deep voice, which turned out to belong to Lee Brady, was in conversation with Brett. Thankfully the wind had dropped and the billy was on – time to get up and start the day. 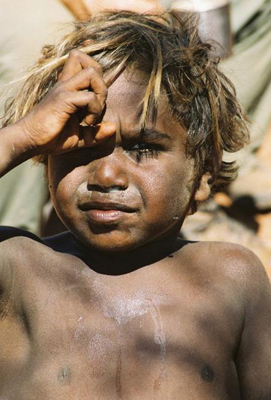 After a good breakfast of eggs, toast and more tea, a man named Sammy, seeing the billy on the fire wandered over to ask for “Cuppa tea cow please, Brett !” – the Anangu people were very fond of a cuppa……..A few yards away, Leah, who was seated in front of the fire, shyly motioned for us to come over and join her. She showed us how she burnt patterns with the hot irons from the fire into the smoothly polished gum bark, each symbol representing the honey ant, witchety grub or suchlike. It was a lot harder than she made it look, as I found out after a few burns from the irons slipping off the shiny wood! She spoke, in a soft, musical voice about the legends of the creatures she was carving. During the morning we were shown how the Anangu people dug deep holes to find their snacks of honey ant. When found, the ant was held firmly by the legs and you bit into the sack of honey on its back. This gave an instant shot of very sweet liquid, which of course meant the immediate demise of the poor ant. The small children who were travelling with the group rushed up excitedly to get their share of honey, eyeing us curiously. We were then taken walkabout with Leah and her friend Renie, to find suitable scrub to dig up and unearth the slimy witchety grubs. These creatures lived in pale glistening clusters in the inside of the tree roots. Once gathered they were crisped up in the embers of the fire and offered to us to eat .I took a deep breath, shut my eyes and crunched ….surprise, just like hokey pokey ! 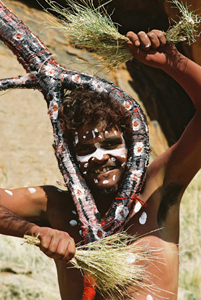 Meanwhile the men had disappeared into the bush to make masks and ready themselves to act out the tale of Wadi Nantuka, the lizard man – the song-line of the Anangu. They made a fantastic job of constructing the mask out of twisted tree branches, tussock and natural dyes. They had also coloured themselves with the earth to mimic the markings of Wadi Nantuka.. The young men all had a front tooth missing, a sign that they had come of age. This added to the feeling of going back in time as we followed Lee and the other men as they showed us the sacred sites where the lizard man had left his mark and told us his story. We spent five days and nights with these people. 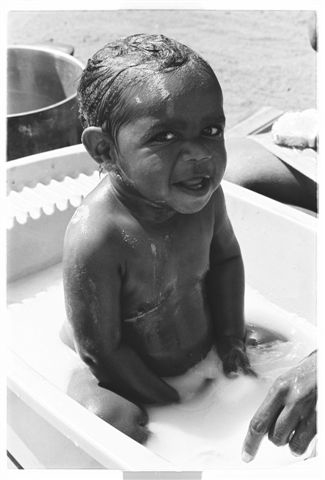 We saw the way they cared for their extended families, the older women gently bathed the young chichis (babies) to temporarily clean them of the red earth that they loved to play in. We met a young couple in their teens, they held hands and smiled at each other when they thought we weren’t looking. We went hunting in the truck and watched Leah throw a torch to burn off the dead growth on her land while the men attempted to unearth a large goanna hiding behind a huge boulder. Then we climbed up into caves and lay on our backs to stare up at the ancient rock paintings in awe. But above all, the highlight was sitting around the fire with these people at night as they shared their many stories with us. I had waited hopefully outside their circle to be invited to come and join them – as Lee said to us, “There are no doors to knock on out here!” We talked about the past and future. They called me “little mother” – their name for me, as I was Paul’s auntie. I observed that many of their thoughts and decisions were made on intuition, such as when and where to hunt. Their senses, not clouded or dulled by our society’s conditioning were sharp. That last night as I climbed into my swag I felt privileged to be allowed into a small slice of these peoples’ lives. When I awoke in the morning they had gone, leaving nothing behind but the embers of the fire. It seemed somehow strangely appropriate.